As soon as I mention I'm a food blogger, the very first question I get asked is... so where's your favourite place to eat? For someone as obsessed with food as I am and with such a great selection to choose from in Edinburgh, this is probably the hardest question to answer. The honest truth is, I don't have one favourite restaurant. It completely depends what kind of food I'm craving, what kind of atmosphere, what mood I'm in etc... So in a bid to help me answer this question, and a bid to steer you all in the right direction, I'm starting a Best of Edinburgh series. To start the series off I'm talking about the best small plates in Edinburgh. Tapas, mezze, wee bites, I'm talking menus where you pick out a few smaller portions to make up a meal. Small plates are definitely one of my favourite ways to eat, my eyes are way bigger than my stomach and I find it so hard to pick just one thing off a menu. With a tapas-style meal you don't have to, you can have as many as you want! Baba is a recent edition to the George Street food scene, and definitely one of my top places to eat at when in the centre of Edinburgh. The Levant inspired food is packed full of flavour and despite being small plates, can be super filling. My favourite savoury dish has to be the beetroot hummus with whipped feta. I want to bathe in whipped feta. Make sure you don't over order and save room for dessert - trust me! You might not expect Baba to have great puddings, but the dark chocolate crémeux with praline and tahini ice cream is seriously delicious. Plus, the decor inside is gorgeous (and I'm cringing while saying this but definitely instagrammable). Best. Tacos. In. Edinburgh. Fact. Bodega is not tapas or mezze but you'll definitely be ordering at least a couple plates. Tacos come in twos, so everyone orders at least two portions each. The menu is small but this is definitely the case of quality over quantity. My favourite tacos are definitely the tempura avocado but I also really rate the prawns, cod and buffalo chicken. There's also always something fantastic on the specials menu. Don't forget to get yourself some guac and chips while you attempt to pick off the taco menu. 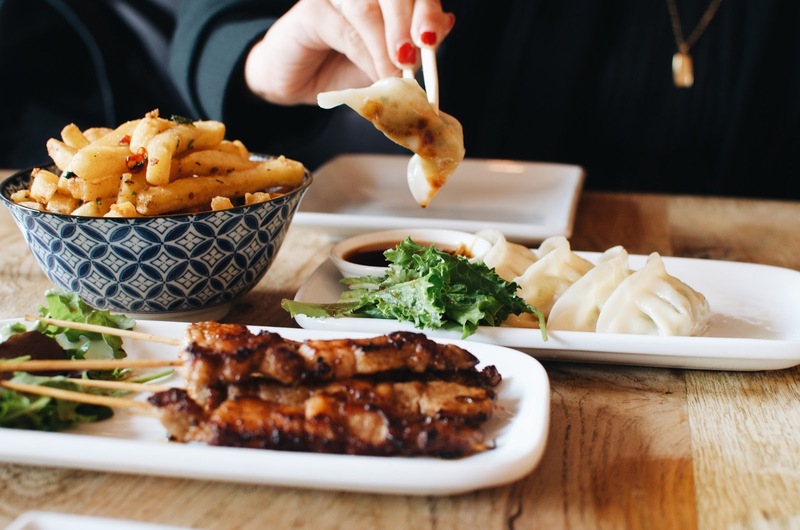 Wee Buddha is a pub with some delicious eclectic Asian small plates. While you can get big bowls of noodles here, the highlights of the menu, in my opinion, are the 'wee hings'. Here you'll find the likes of haggis wontons (yes please), salt and spicy squid (yes please) and pad thai wings (yes please). The cantonese seasoned chips are a must order, I'd go to Wee Buddha just for them. They also have a great booze selection including a bunch of Asian beers and the best cider in the world (whisky cask Thistly Cross, duh). El Cartel is home to the best margaritas and guac in Edinburgh, fact. I will hear no objections to this. The combination of great (strong) margaritas and the most delicious Mexican street food menu is pretty dangerous. You will end up ordering so much food the waitress advises you to stop ordering. I mean... this has never happened to me... Anywaaay the guacamole in El Cartel is unbeatable, topped with feta and pomegranate and served with plantain chips. They're always changing up their taco menu with exciting and unique toppings, I've currently got my eye on their Taco de Remolacha (charred beetroot, beet mole, pico, soft cheese and peanuts). PS: Another El Cartel is coming very soon on Teviot Place! This is the perfect place for some wine and tapas and definitely worth the trek down to the bottom of Leith Walk for. Here you'll find classic tapas dishes like Spanish omelette, patatas bravas, and, of course, chorizo al vino. There's a big range of small plates here as well as delicious Spanish cheese and charcuterie share boards. They have a delicious wine menu to pair alongside your meal, and the restaurant has a really chill atmosphere. So those are my favourite places for indulging my greediness. I mean, who wants to order just one meal anyway? Let me know what your favourite small plate restaurants are in Edinburgh, I'm sure I've not discovered them all! What other Best of Edinburgh lists should I make?